Can't get a date, eh? Maybe your problem is the state you're living in. It appears there aren't any boys or girls in Maine. You've gotta stop hanging out with those lobsters Chris! Your dating problems might have to do with your holding your hand up in front of your face all the time! Any idea when the 1890 map was made? Hmm, and all this time I thought it was the halitosis and the unibrow. 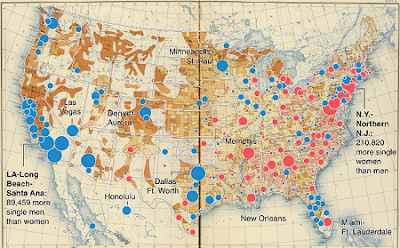 It comes from the Statistical Atlas of the United States, published by the United States Census Office in 1898. The Rumsey maps are hard to link to directly, but a link to the atlas may be found on this page.